Lincoln's newest Continental, top, and the Bentley Flying Spur, bottom. A row between Bentley and Lincoln’s design chiefs erupted late Monday after Ford Motor Co. showed the 2016 Lincoln Continental Concept ahead of the New York auto show. 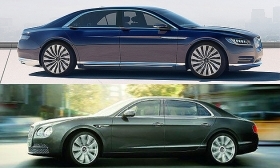 Car Design News reported that Bentley’s chief designer, Luc Donckerwolke, took to social media to criticize Lincoln for the design of the new Continental, which from the side view seems to share some similarities with the Bentley Flying Spur, especially around the side windows. Both cars have expensive-looking chrome trim in the same general shape around the windows and rear haunches. “On the Facebook page of Lincoln chief designer David Woodhouse, Donckerwolke asked rhetorically: ‘Do you want us to send the product tooling?’” Car Design News reported. It’s also unusual for two cars with the same name to compete in the same markets at the same time. Bentley has had a Continental in its lineup since 1984, while Ford’s Lincoln division dropped its Continental in 2002, ending an unbroken run for the nameplate in Lincoln’s lineup that started in 1982. The Continental nameplate has been in the Lincoln lineup since 1939, save for a few years because of production interruptions. Lincoln spokesman Stephane Cesareo said the automaker has the right to use the Continental name on a vehicle in any country Lincoln cars are sold. And that includes China, he said. Ford Motor has kept the Continental trademark current, he said, even though the name has been out of the Lincoln lineup for more than a decade. Bentley spokesman Graeme Russell would not comment on his company’s right to the name, except to say that it has appeared on cars built by Rolls-Royce or Bentley since at least the early 1930s. Rolls-Royce and Bentley were part of the same company until Vickers PLC split the brands in 1998 and sold Rolls-Royce to BMW and Bentley to Volkswagen. Previously, automakers have worked out agreements with competitors and others to protect vehicle names. For example, GM’s now-defunct Pontiac division and British motorcycle manufacturer Triumph agreed in the early 1960s to share the Bonneville name. Under the agreement, Triumph refrained from making vehicles with four wheels using the Bonneville name, and Pontiac promised not to build any motorcycles named Bonneville. But the look of the Lincoln has Bentley’s design team angry. “This behavior is not respectable. Building a copy like this is giving a bad name to the car design world,” Donckerwolke told Car Design News. The 2016 Lincoln Continental, Ford says, will start production next year and be offered in the U.S. and China -- two of Bentley’s largest markets. This isn’t the first time Ford has been called out for designs that are close to another company’s trademarked intellectual property. In 2011, Aston Martin, which was once owned by Ford, complained that the trapezoidal grille design on such cars as the Focus, Fusion, Mondeo and Fiesta looked too much like those on its own cars.